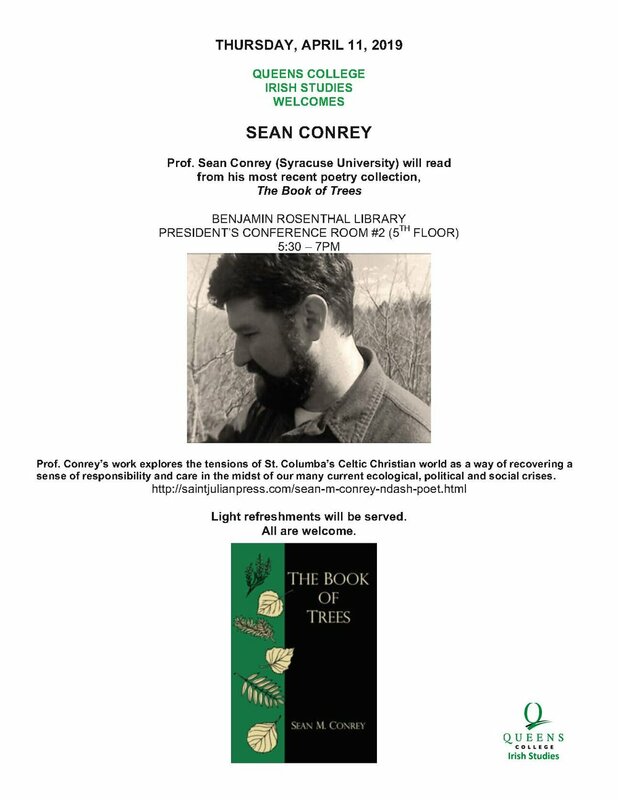 Events and lectures sponsored by the Irish Studies program at Queens College. Friday, October 19, 7:00 p.m.
Jarlath Henderson is a wildly inventive multi-instrumentalist and masterful balladeer from Northern Ireland who is best known as a remarkable player of uilleann pipes and whistles. A three-time All-Ireland Champion piper, Henderson revives traditional songs, such as murder and love ballads, with a somber intensity through his sublime original arrangements (“new and otherworldly”—NPR Music). Thursday, October 19 at 7:30 p.m.
Monday, October 15, 2018, 7:30 p.m.
Friday, September 21, 7-8:45 p.m.
Thursday, February 22, 12:30 p.m. Please join us for a talk by Dr. Críostóir Mac Cárthaigh of Ireland's National Folklore Collection, who will discuss the collection and archiving of Ireland's folklore from the twentieth century through the present. Free Irish lunch will be served by the Butcher's Block of Queens! This lecture is part of the three-day symposium, "Irish Language Literature and the Folklore of Ireland," sponsored by LehmanGaeilge, the Irish Language Program in the Department of Languages and Literatures at Lehman College, CUNY. The symposium is supported in turn by the Department of Culture, Heritage and the Gaeltacht, the Fulbright Commission in Ireland and the CUNY Institute for Irish-American Studies. Irish Studies at Queens College is grateful to Dr. Tomás Ihde, Chair of Languages and Literature at Lehman College and professor of Irish at Queens College, for initiating this exciting collaboration. Tuesday October 17 2017 at 4 p.m.
Lawrence McCullough is the author of “What Whistle Would You Play at Your Mother’s Funeral?”:L.E. McCullough’s Writings on Irish Traditional Music, 1974-2016, Vols. 1 & 2. This 726-page, illustrated set assembles in one collection the more than 300,000 words on Irish music and culture published in 43 years of research and teaching. Tuesday, April 19, 2017 at 3:30 p.m. Please join us for a discussion and hands-on training session in the skills of doing oral history. Students and volunteers will learn about using technology, asking questions, and time-coding and editing the material. There will also be an opportunity to volunteer for different oral history projects taking place on the QC Campus. FREE CATERED LUNCH BY NEW YORK CITY’S BEST IRISH GROCER, THE BUTCHER’S BLOCK OF SUNNYSIDE! "At Home in the Easter Rising: Fairies, Rebels, and 1916"
Wednesday Sept. 21, 12:15-1:30 p.m.
Lucy McDiarmid is Marie Frazee-Baldassarre Professor of English at Montclair State University. The recipient of fellowships from the Guggenheim Foundation, the Cullman Center for Scholars and Writers at the New York Public Library, and the National Endowment for the Humanities, she is the author or editor of seven books. Her scholarly interest in cultural politics, especially quirky, colorful, suggestive episodes, is exemplified by The Irish Art of Controversy as well as by Poets and the Peacock Dinner. She is also a former president of the American Conference for Irish Studies. Her most recent book, At Home in the Revolution: what women said and did in 1916, was Foreword Reviews’ 2015 Indiefab bronze winner for the history book of the year. Professor Cassvan will discuss the continuing relevance of William Butler Yeats's great elegy "Easter 1916," focusing on the tradition of the elegy, and some of Yeats's major thematic and aesthetic preoccupations. It is a work that makes palpable the poet's insight that "We make out of the quarrel with others, rhetoric, but of the quarrel with ourselves, poetry." "A Nation Rising: 100th Anniversary of the 1916 Irish Rebellion"
Curated by Eileen Colleran Sprague and Patricia McCloskey, with the assistance of Mary Glynn of the college’s Art Library, and Professor Matthew Greco and Linda Jackson of the Art Department. Wednesday, May 11, 12:15-1:30 p..
Patrick McGough will discuss the reaction to the Irish 1916 Rising in comparison to the 50th anniversary of the Rising in 1966. The 1916 Rising was judged harshly for the most part at the time of its occurrence. In contrast however the 50th anniversary commemoration was celebratory and less analytical. This event is in conjunction with the current exhibit in the Barham Rotunda Gallery: A Nation Rising: The 100th Anniversary of the 1916 Irish Rebellion. Queens College, in partnership with the American Irish Historical Society and the CUNY Institute for Irish-American Studies, is honored to welcome Professor Kevin Whelan to present a lecture on, The 1916 Easter Rising in a Wider Perspective. This illustrated lecture considers the 1916 Rising in Ireland as the military culmination of a longer political, social and cultural revolution that should be set within wider international, imperial and military contexts. The Rising should not be viewed through an exclusively Irish lens: it involved several international actors – the British Empire, the protagonists of the First World War, the Women’s Movement, the Catholic Church, and socialism. Ignited by international as well as national forces, its outcome must also be assessed in terms of the arid post-war settlement that contributed to interwar fascism and authoritarianism. This lecture deploys a wider geographical horizon and a longer time frame to contextualize the 1916 Rising. Dubliner Eamon Grennan is the author of more than ten collections of poetry including his forthcoming, Out of Sight: New & Selected Poems; he also has written a book of essays, Facing the Music: Irish Poetry in the 20th Century; and has translated the poems of Leopardi, for which he received the PEN Award in translation. Over the past few years, Grennan has been writing and directing “plays for voices” for the small Irish Curlew Theatre Company. Professor Emeritus at Vassar College, he now divides his time between Poughkeepsie and Connemara. Dr. Maureen Murphy will be joining us on March 6th to kick off our Spring season of programming here at QHS. Her research focus includes Irish and Irish-American history, folklore, and literature, and she will be speaking to us about the role of women in the Easter Rebellion in 1916. Dr. Murphy is a Professor of Curriculum and Teaching in Irish History, and the Co-Director of the undergraduate Irish Studies minor at Hofsta University. She is also the historian of the Irish Hunger Memorial and author of Compassionate Stranger: Asenath Nicholson and the Great Irish Famine. $5 QHS Members, Students & Seniors; $8 General Admission for all lectures/events, unless otherwise stated. All are welcome to attend activities related to the symposium at Lehman College February 19-20, 2016. 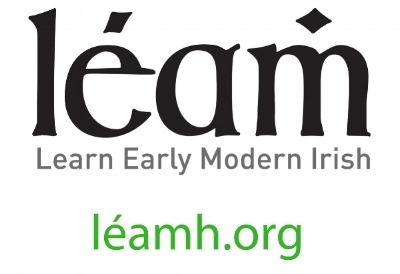 A full list of events and papers is located at http://www.lehmangaeilge.org/ . Register at the reduced rate of $20 before February 15th. Lunch Friday and Saturday is included. Symposium keynote speakers from Ireland include historian Aindrias Ó Cathasaigh who has authored books and films on the Easter Rising of 1916 and author Fionnuala Uí Fhlannagáin who has written two books about the history of the Irish in America. Poet Ailbhe Ní Ghearbhuigh from NUI-Galway will do a pre-conference bilingual reading Thursday evening at the CUNY Graduate Center from her most recent book. 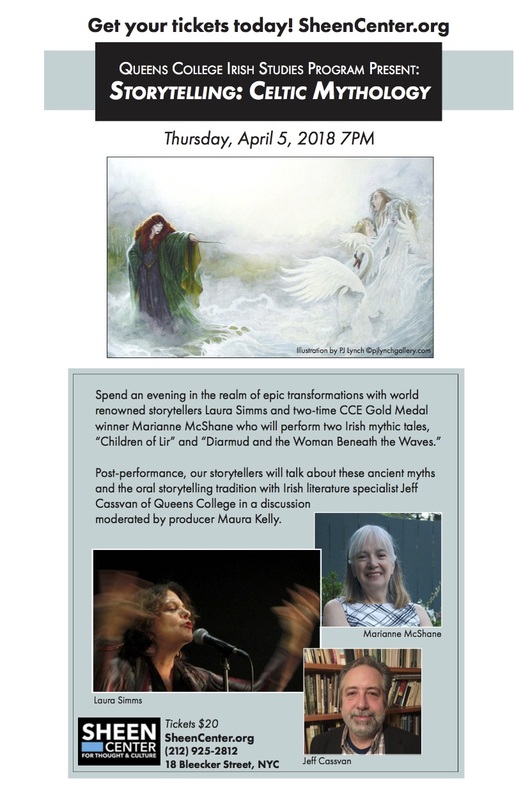 Friday’s events will be in English at Lehman College, CUNY. Saturday’s events will be in Irish at Lehman College as well. Dinner at Rory Dolan’s Restaurant Friday evening is an additional $30. Séamus Blake and Eileen Zurell will be honored for their years of service to Irish Studies at the dinner. The symposium is made possible by a grant from the Department of Arts, Heritage and the Gaeltacht and the Irish National Lottery supported by the Ireland-United States Commission for Educational Exchange (Fulbright Commission). Thursday, February 11, 2016, 7-9 p.m. The recent marriage equality referendum in Ireland was a historic event, with the yes vote reflecting deep transformations in the country, and impacting the future of other European countries. Please join us, in partnership with the Center for Lesbian and Gay Studies at the CUNY Graduate Center, in a discussion with Quentin Fottrell, an Irish member of the LGBT community and a journalist for the Wall Street Journal, to discuss the referendum's aftermath and the implications of the vote for countries across Europe. Free and welcome to all, with refreshments. The "Redlegs" were descended from men and women expelled from Ireland in the seventeenth century to work as indentured servants on plantations in Barbados and other Caribbean islands. Please join us for a fascinating lecture by Dr. Matt Reilly, an archaeologist, who will discuss their world, their relations with African slaves, and their enduring legacy and memory in shaping the history and culture of Barbados. Free lunch catered by the famed Irish Butcher's Block of Sunnyside! "Dublin Jewish Spaces, Faces and Places"
Dr. Melanie Brown co-ordinates the ongoing Dublin Oral History Project, a voluntary undertaking whose remit is to chart the lived experience of Dublin’s Jewish community in the twentieth and twenty-first centuries, of which she is a part. The Dublin Jewish Oral History Project was conceived by the Jewish Representative Council of Ireland in 2010, as a response to the imperative to capture life stories of members of the aging and rapidly diminishing Jewish community of Dublin. Dr. Brown was invited to coordinate this project on a voluntary basis in 2011, with over forty interviews conducted since, mainly in Dublin but also in the UK, the USA, Canada and Israel. Among the themes which have emerged are Jewish communal, religious and secular life in Dublin; education; emigration; philo-Semitism and anti-Semitism in Ireland. Dr. Brown was formerly the Composer-in-Residence with the National Chamber Choir of Ireland, and is currently a Local Centre Examiner at the Royal Irish Academy of Music, Dublin. Her principal research interests include Irish Jewish culture and identity, and both oral and documented Jewish history in Ireland from 1660 to the present, topics upon which she frequently presents and publishes to an international audience. In this 100th year of Dubliners' publication, Professor Cassvan will be discussing the book’s continuing relevance as a work that teaches us important lessons today. Wednesday, October 22, 2014 from 12:15-2:00 P.M.